One more post from me today, so I don't get behind this week, I have a lot to share. I enjoy doing the Sketch Challenges, as the majority of my thinking process is already completed by having a sketch to look at, I just need to incorporate my images. A few weeks ago, Nancy from Rare Image Rubber Stamps had emailed me and asked if I'd like to do some design work for her, of course I eagerly jumped at the opportunity! I loved her Pets Sheet, just hadn't gotten around to fitting them into my budget! For my card, I used the Warhol Technique, CPS Sketch 96, and one of the dog images from RIRS Pet Sheet. I stamped my images in Black Archival using my SAMJ, on Chocolate Chip, Really Rust and More Mustard, layering them on my Black Panel, then my Caramel base card. I used my Dog Chronicle DP from Karen Foster Design for the bottom two panels, sponging them with Chocolate Chip Ink, then layering them onto my Black panels, then Caramel base card. 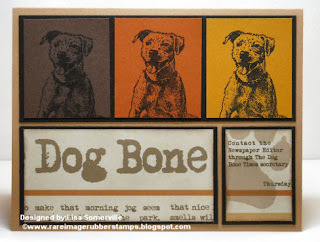 Be sure to stop over at the Rare Image Rubber Stamps Blog - Nancy is offering FREE domestic Shipping through December 25. What a cute puppy!!! Love this card! Oh my goodness, how cute is this!!! Adorable image and such a great way to carry it out. LOVE what you did with the CPS sketch. Love it! Great sketch and this image is darling with it. Love the simplicity of stamping the image on the colored paper and coordinating it with that patterned paper. Adorable card. Great images and congrats on being chosen. I want this stamp! We have a wonderful pit bull, Rudy, a loved certified Therapy Dog, who visits a nursing home. Brilliant card, love the image.